To me summer is all about enjoying the nature. I love the sun on my skin, the abundant bounties of earth in the form of fruits, vegetables and the luscious, colourful flowers. I also enjoy ice cold beverages to keep me cool. And as usual, I often experiment with ingredients. Recently, I bought rose syrup to try my hand at making a tradition drink called Falooda which is a flavoured milk drink with basil seeds and vermicelli topped with ice-cream. I will post a recipe for this drink at a later date. Now I had to buy a bottle of rose syrup that is almost 700 ml. Well, you don’t need the entire amount for falooda. So I was left to wonder what to do with next. What came next was an idea when I decided to try making some basil lemonade with some freshly picked basil from my little container garden. Now the problem was I only had lime on hand. So I started making this drink and then my eyes landed on the beautiful red bottle of syrup which was just staring at me from the table. And as you know by now, I do love colourful food. So I decided to skip the sugar or simple syrup in my limeade and replace it with the lovely red rose syrup. The result was an absolute delight. 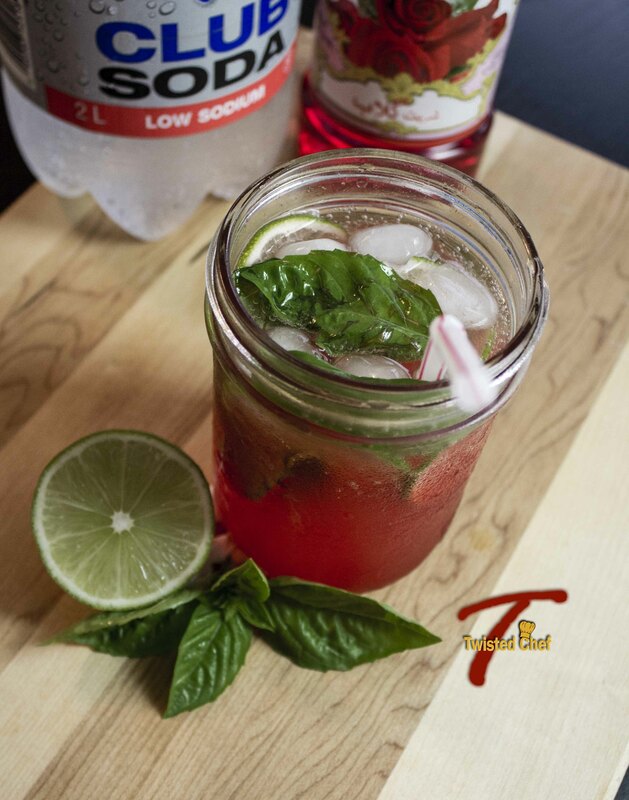 In a large glass or small pitcher, place the basil leaves and some of the lime juice and muddle the leave a little. Now add the rest of the lime juice, rose syrup, water and mix. You can add some simple syrup at this point or more rose syrup if you like it sweeter. Fill 2 glasses with ice and divide the mixture between them. Now top up each glass with club soda. Garnish with a slice of lime and serve. Basil leaves in the drink will get stronger and stronger as time goes so add them about 5 to 10 minutes before you drink unless you enjoy a very strong basil flavour in your drink. Adjust each of the ingredients in this drink to your taste. 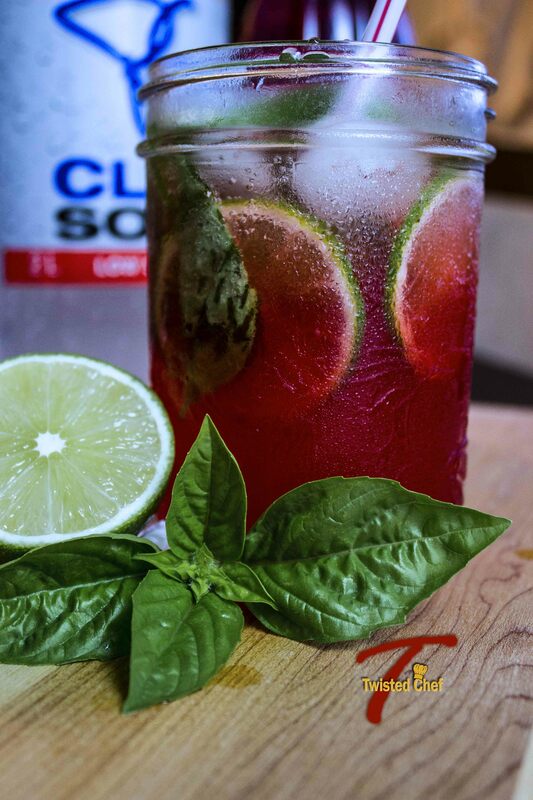 Club soda can be substituted with water. Just to let you know that I picked your recipe as my host favorite for the week. It will be featured over at the Daily Dish Magazine on Monday ~ here is the link when it is published ( http://wp.me/p2MupJ-36r). It will also be featured on my post for this coming week’s party. I hope to make it soon as it looks delicious and something that I enjoy. Great recipe… love making drinks and this one is superb. Thanks for sharing it on Foodie Friends Friday and sharing it on my facebook page. This drink sounds amazing. I will love it when it gets a bit warmer in the southern hemisphere! This sounds so refreshing! Perfect on a hot summer day. How I adore this drink!